I've spent most of the day (in between emails and phone calls) doing some final twiddling with my We Can Be Heroes paper. As usual, now that I've had quite some distance from it as it has moved through the review process, I can see all sorts of terrible glaring holes in the argument and discussion. And, as usual I'm filled with doubt as I prepare to send it out into the world of publication. I think it's true that we're our own worst critics....so I bravely battled on through the final editing, ignoring the looming vision of the very different paper that I now think it could become. The suggestion was that I broaden my theoretical allusions in footnotes etc....that is, I should point out the resonances with what I am saying about Deleuze and resistance, with more of his writing, including A Thousand Plateaus. It was strange going back to this book which almost eight years ago was my first encounter with poststructuralism. In particular, I was struck again by Brian Massumi's foreword. What's interesting is that I think it took a good eight years for any of the concepts in this book to start to really resonate with me (and I am the first to admit that I am a long way off understanding even half of it). On first reading, I found it oh so abstract and difficult. The language is challenging and the writing style (admittedly in translation) is free flowing. Today, though, as I delved back into the book in a search for some appropriate quotes, I could see how over the past few years through the gestation of my phd, I carried many of these concepts with me and they were gradually illuminated by accompanying theoretical readings as well as my ongoing engagement with television. Massumi also likens engaging with the book to buying and listening to a record. And now with the benefit of hindsight I can see how this was true for my own concern with television and it's potential for resistive formations. This was a tune I had been humming since my honours thesis (prior to A thousand plateaus). And it was the "refrain" that I returned to again and again through the phd process, until it finally formed into the thesis. And now, I also find myself returning to it, each time humming basically the same tune, but with the differences of time, opinion and new thoughts producing variations on the theme. The music analogy is particularly resonant for me I guess. And Massumi's continues it in his final statement as to how readers should approach the book. The question is not: is it true? But, does it work? What new thoughts does it make it possible to think? What new emotions does it make it possible to feel? What new sensations and perceptions does it open in the body? The answer for some readers, perhaps most, will be "none". If that happens, it's not your tune. No problem. But you would have been better off buying a record. Anne and I met again for Foucault (and nice coffee) this morning. This time we tackled Part 4- Prisons: Complete and Austere Institutions. We're getting excited because for a while there it didn't look like we'd ever get to the end. But we have set ourselves the final two sections for next week. Just as well really, as we are scheduled to give a research presentation at uni in the beginning of September about this very reading group. So it will probably look better if we have at least finished the book we set out to complete. I think this chapter (and really the whole last section of DandP) is particularly interesting because Foucault really gets stuck into the whole question of delinquency. With the modern practices of the prison, he observes a microcosm of disciplinary society more generally. And he spends quite some time describing the difference between an "offender" and a "delinquent". For the "delinquent" is produced and made visible by the very disciplinary, penitentiary techniques that are designed to transform and correct his/her behaviour. This is perhaps what is really fascinating about disciplinary procedures which are operations of control and normalisation. They always carry with them a residue of resistance, here defined by Foucault as delinquency. While a lot of the discussion was about the actual chapter, we also spent some time chatting about what we should include in our presentation. At the moment ideas range from why we started reading together (and why we started with Foucault in particular) - through to what it means to be a "researcher" in a regional community. Coffee and chocolate brioche was fantastic by the way. OK so I only have myself to blame. I returned to the coffee club for takeaway coffee and this time I was rewarded with MOSTLY FROTH and no milk. Is this the universe playing a joke...did someone tell them about the inadequate froth to milk ratio of last Tuesday? "Rise and shine campers, and don't forget your booties, because it's cold out there today....."
I wonder how many more days of winter we have here. And no groundhog to help me out! It's freezing inside and outside and I'm wearing my England coat which is pretty warm, although it's disadvantage is it doesn't cover my hands. No...not for a catchy theme tune which will sweep a 1970s labor government to power. 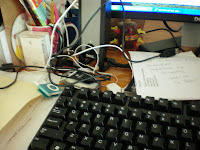 Rather, I think it's time to tidy my desk at home. 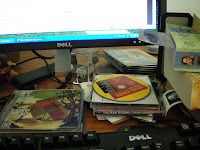 Stuff has been gradually piling up and encroaching on the keyboard, so that I am barely left with room to swing the mouse. As a teacher I think it's easy to lose sight of the effect our feedback can have on our students. I was chatting about this with a colleague this morning. Sometimes, instead of calmly pointing out mistakes and providing careful constructive criticism we just want to tear our hair out, screaming...WRONG, WRONG, WRONG! Of course, I don't know that this would really have the desired result....although it might make us feel better in the short term! This was really brought into sharp relief for me today when I received a paper back from a reviewing process. The editor of the issue had taken great pains to give a lot of constructive criticism in a positive and encouraging way, emphasising that it's nearly ready for publication. And the effect of this on me was to think confidently about my ability to make the required changes in a timely manner. It's not always like this when review comments are returned from journals. The power of the written word is great indeed, especially when the reviewers make little effort to be constructive or helpful in their criticism. And in these instances my reaction is usually to go into a mild panic and not know where or how to begin revising. I know in writing academic articles it would be nice to be able to separate ourselves from our work, but for me the reality is that my research is a part of who I am, so that line is often very blurred. Rehearsal was interesting this afternoon...most of the time was spent on the "dream sequence". Interesting because I have been rewatching the documentary on Broadway: The American Musical and they had comments from Agnes B De Mille who choreographed the original Oklahoma Broadway production's dream sequence. She said originally Laurey's dream was set to be in a circus! Thanks goodness they changed it after her questioning of Rodgers and Hammerstein. It also goes on for 15-20 minutes in the original show. With the modern audience in mind, our insightful directors have chosen to cut it down to around 5 minutes. Quite frankly dream sequences like this usually make me want to run screaming from the room, but i think i can manage to survive the five minutes or so that we're keeping. Lyne, our choreographer, has done a great job to focus on the drama and the story, and because I have to be on my toes to play the music, I've got something to keep me occupied for the duration. Anne and I met for Foucault yesterday afternoon and worked our way through the Panopticism section in Discipline and Punish. Once again, for me Foucault provided an evocative phrase describing panopticism, and in turn, disciplinary operations, as a "cruel, ingenious cage" (p. 205). I can't believe I didn't notice these beautiful turns of phrase on my first reading. But as Anne commented yesterday, it really is a book that requires reading more than once. Because of Foucault's writing style which is episodic, intuitive yet intensely empirical, it is difficult to read the book like a formal argument where the thesis is clearly and completely stated up front and then supported with evidence in a descriptive, narrative way. Rather, the thesis evolves through his engagement with the historical evidence. He states and restates, refining and adding more detail to his argument as he goes through. He investigates and maps...modelling a style of critical thinking and engagement - with the world as it was and as it is now. The introductory example of the plague towns and the procedures that were carried out to prevent infection was one I hadn't remembered. Foucault uses this as a prologue to his central example of Bentham's Panopticon. Apart from being interesting, the plague is a useful example for emphasising what he describes as the disorder and confusion which must be present for disciplinary procedures to be successful. So clearly, this is a model of surveillance, but as Foucault points out what makes this disciplinary power even more effective and insidious is that it is quickly internalised. That is, it doesn't matter if there is a supervisor or not, it is the thought that there might be that works to induce certain behaviours. Power is "visible and unverifiable" (p. 201). And what Foucault goes on to say is that this kind of disciplinary power operation is not restricted to Bentham's prison, it is "a generalizable model of functioning; a way of defining power relations in terms of the everyday life of men." (p. 205). Foucault then spends the second half of the chapter going into great detail, tracing this social transformation and drawing back on the examples he has already introduced throughout the book to this point: the military, the hospital, the school. And he sums it up very nicely in his final question: Is it surprising that prisons resemble factories, schools, barracks, hospitals, which all resemble prisons?" (p. 228). Anne saw great possibilities for her own research in terms of the internalisation of surveillance with Syrian/ Lebanese immigrants and found the sections where Foucault wrote specifically about the police and power particularly interesting. We also discussed his use of the word "technology" which can be confusing as we usually employ the term to refer to a specific tool or implement, but Foucault uses technology to refer also to the principle of power that can be abstracted from specific tools or cultural sites. We also discussed the proliferation of surveillance in our daily lives...from cctv, to quality assurance and performance evaluations in the workplace. Next week "Complete and austere institutions". 3. The other white haired archaeologist with the colourfully striped jumper - maybe his name is Mick? Does anyone else remember the entertaining storytelling monologues Tony Robinson did many years ago - something like "Fat Tulip and Friends" - perhaps screening on the ABC around 4:30? (when I say many years ago it could be about 20!). Aaaah...good times. Back on Time Team - I'm sure there's a wonderful drinking game that could played - based on the number of times in any given episode they mention "geophys"...or is that "geofizz"...? Well firstly I would have guessed Bert was a little older than 70. That hair - or rather, the nylon that is doing a poor impression of hair - is not aging gracefully. The Newtons played happy families and Australian tv personalities all trotted out to fawn over Bert. Surely, no-one can be that fantastic all the time! Never mind, the work with Graham Kennedy always holds its own, and Bert remains the master of the double entendre. A little respect for the institution people. Plus he accompanied me through many a dull morning during the mid-90s transtition from uni to employment with Good Morning Australia. Another sharply observed episode - this time on the strangling diplomatic discourses of foreign relations. However, my favourite line was the throwaway regarding the Australian film industry, "Christ, why can't we make happy films?" (or something to that effect).....Why, indeed? (I see Estelle Getty from the Golden Girls passed away. The Golden Girls was staple TV viewing for me growing up in the 1980s. Why? because it was funny (and still is amusing going by the episode I caught one afternoon a little back). And also because when there were only 2 TV channels in the Wide Bay so we had to watch something. This fact also explains the huge number of episodes I watched of Full House, Who's the Boss, The Cosby Show, Roseanne, Home Improvement and any other American sitcom you care to name). I think we might well be in the midst of a televisual obsession with panel shows. Like one expert isn't enough...let's have a multitude. Maybe this broad genre has always been a feature of the television landscape but let's make a little list: Q and A. Difference of Opinion, Salaam Cafe, Spicks and specks, The Einstein Factor, The Gruen Transfer, Insight (where the whole audience is a monstrous panel), Good News Week, The various Footy Shows, The Panel (although no longer airing - but at least the title made its intentions perfectly clear), First Tuesday Book Club, and others that I probably haven't thought of. Why?...is it the simulation of conversational style, are we the audience meant to identify with one or more of the panellists and imagine ourselves up there, are the variety of opinions designed to keep us watching. Anyway, none of this happened with Q and A. I tried hard but turned it off after 30 minutes or so. The incorporation of "audience participation" and the explicit emphasis on the "liveness" of the program (in the eastern states!) doesn't do a whole lot for me. Plus I don't understand what an emissions trading scheme actually is, so the endless nit picking between panellists about this was mind numbing to say the least. On Spicks and Specks there's some jokes (well intentional ones anyway!). Yes I know - she's writing about it again. But really how can you not love a program that highlights the difference between "disinterested" and "uninterested". Also, this week there was a development in the grammar correction when it became bilingual as Gil pointed out some inaccurate French. Points too for the inclusion of Mark Philippousis in an aside conversation. In years to come this may well become "reference to obscure Australian tennis player"
Does anyone else notice how there's absolutely no decent free to air viewing on a Friday evening. Don't those television networks realise that some of us don't have lives and need some entertainment at home?? Anyway, this week Better Homes featured some of those disturbing hairless dogs, showed how to make sweet and sour pork which you then served up to the table in....(wait for it)....half a pineapple (for goodness sake), as well a tour of a Chinese garden in some blatant Olympics cross-promotion. What more could we want on a Friday evening. And gross out sight of the week was Dr Harry trimming the feathers around a budgie's eye....I had to look away. Peter Cundall's last show was more than a little moving. His enthusiasm for gardening is infectious, but more than that, his life seems to be a practical elaboration of his principles about the world. Something for everyone to aspire to. An unexpected meeting of the Bundaberg Chapter of the Foucault Reading Group is happening later today...topic...The Panopticon. 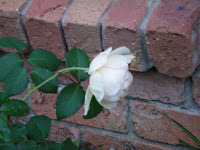 I know the photo's a little blurry but I'm very impressed that I actually managed to grow a rose bush that flowered successfully. This one is a little droopy because it bloomed during the heavy rain of this week. What's my secret I hear you ask...well mostly neglect, some kind of spray I found at Bunnings when aphids threatened about a month ago and... and well, nothing else really except water every so often. how much lettuce is too much lettuce on a sandwich? Well, going by my lunch today, when one can reassemble the leaves into an entire head of lettuce then perhaps the chef has gone a little overboard in the lettuce stakes. Jinx (in her wonderfully American fashion) suggested I should ask for "easy on the lettuce" next time. This led to a Seinfeldesque conversation about the idiosyncratic ordering style in the USA. Lettuce on the side= self explanatory really - put the lettuce beside the sandwich. I'm not sure why anyone would do this with lettuce but I can see its applications for mustard, gravy, mayonnaise etc. Here endeth the lesson in ordering! (But one for all the Seinfeld fans...what I really ended up with today was a "big salad" between two pieces of turkish bread. Except, unlike the original big salad, no one else was taking credit for it). Well the weather is certainly conducive to working indoors today (not that I work out of doors any other day) but still...there's something comforting about sitting inside soaking in the artificial light with the rain and gloom outside. So a good day to get something substantial achieved on the thesis-to- book project. I managed to make my way through the third chapter yesterday and finish off the changes I had made. Today I attacked the fourth chapter. Of all the chapters in the thesis this is the one least plundered for papers over the last 18 months or so. As a result, it was the least well remembered. This was helpful in one way as it was almost like reading it for the first time. So I went a little crazy with cuts and edits, and was surprised at the density of the analysis in places - particularly, the section on Bruce Gyngell. I know when I first wrote this I thought it was great and really central to the thesis, but now I'm less sure. I think it will need some more consideration to see how I can make it more readable. I enjoyed reliving the Graham Kennedy as I read through (particularly after watching Bert Newton last night on TV). Kennedy really was the King...he set the tone and style for so many television performers who have followed him. Bert was the straight man most of the time and it was Kennedy who blazed the way. So while Bert's still got the one liners, the innuendo and the timing, I think it was Kennedy who was really creative and spontaneous. A shame he's no longer around but I don't know if he could have ever surpassed the early work on In Melbourne Tonight. In his later years it all became a little too obvious...he sort of became a parody of his younger self. And why does he always sound like he's about to burst into tears in the post race interviews? Perhaps the fact that I'm even worrying slightly about this indicates I haven't got enough worry in my life already? What I liked this time with Fever Pitch was that although my knowledge of English soccer (or "football") is extremely minimal this didn't prevent me from engaging with it. For me what Hornby is writing about more generally is the business of being a fan - something that most of us can relate to in one area or another. But he's writing intelligently about other things as well...contemporary masculinity, the changing social and cultural fabric of Britain, gender and family politics. And every time I got to the point of "enough with the navel gazing" he would move away from the detailed self-examination to consider these broader themes. Fever Pitch perhaps does this more successfully than High Fidelity. The strength of High Fidelity, for me at least, is that I can identify with the oh-so-selective and judgemental music fan he portrays. Not that I take myself quite so seriously as these characters... anymore...but I do recall some cringe-inducing moments when I have lectured others about their musical tastes (or lack thereof). I don't do this now. Sure they're not "difficult" reads...but sometimes that's the best kind of reading. Another monster rehearsal last night at the theatre. It was all work on the chorus numbers so heaps of repetition of entrances, singing, dancing, as well as singing and dancing at the same time. For me, it was three hours of almost non-stop playing. While the chorus music isn't too difficult (and I've developed the knack of knowing what to leave out...the main principle at the moment being "bash out the melody! "), I did have to concentrate so I was ready to start when they were ready to enter, sing or dance etc. Still it's fun when the chorus people are all there...lots to watch and people to chat with...and plenty to laugh about! Those songs do get stuck in your head though..all day I've been "many a new day-ing"
why oh why do i continue to get takeaway coffee from the coffee club...it tastes like mildly coffee flavoured milk....i took the lid of my so-called cappucino to discover - NO FROTH AT ALL! Well the piano launch concert went quite smoothly. For any readers in the wide bay keep an eye on the local news in the next day or two because the channel seven cameraman was there and spent quite a long time recording our piano trio. and. we've also been photographed for the local paper! Such a media tart I am becoming. Let's hope the television news don't use the part where I thought we were stopping and stared straight into the camera like a piano playing fool. Beethoven was okay...nerves were mostly controlled although I was surprised by the depth of tone in the lower register and wasn't quite happy with my projection of the melody line. Picky, picky. Still...not bad for minimal practice (ie. a couple of run throughs the day before). Every year I resolve to do more regular practice on important things like technical work...and every year it just doesn't really happen. I arrived at the theatre just in time to begin the run through of Act 1. LOTS of stopping and starting at this early stage...though some scenes are coming together. But some hilarious moments as the men attempted to sing and move at the same time. I'm sure they'll get there. Partly inspired by Circulating Library's Catriona who has ongoing threads on different topics, I thought I would try a progressive thread on what caught my eye on TV during the week. So here we go....over the past seven days I haven't caught as much TV as I would have liked due to my various commitments so this post may well be a little impressionistic. I'm old enough to remember when Bob Hawke came to power (even though I was many years off voting!). I think Denton was better in this interview than he was the week before with Helen Thomas. With Bob he managed a more wide ranging interview and didn't back off from the personal stuff (as he eventually did with Thomas). It was interesting to learn of Hawke's background - particularly his relationships with each of his parents. Particularly surprising was the revelation that Paul Keating was expected for dinner with him quite soon. So the political daggers at 20 paces have receded. Hawke was quite philosophical about his political years, and for me working in education, his dictum that one should work to help others struck a chord. Once again a spiffing episode. The satirical targets here were the "jobs for the boys (and girls) of prime diplomatic postings for ex-polllies. Again cuttingly and incisively observed, my favourite line was when the staffers were chatting on the new guidelines for diplomats which required proficiency in a second language: "Does swearing count?" Provided the visual highlight of the week with the "Goths Dating" - Kynt (surprisingly pronounced "Kent") and Vixen. Anyone who can race around the world and keep up with their intensive eyeliner and pancake foundation regime (especially in the heat of India) gets my vote. Although maybe that's also why they're losing. Great music, but a dreadful musical, far inferior to hilarious Singing in the Rain which followed it. I love musicals but I do really dislike the fashion for "dream ballets" in musicals of this era. This one has a doozy which seemed to last for at least half an hour. (Singing in the Rain has one too, but it is also far funnier on the whole and so is forgiven). And really I just can't buy Gene Kelly as a starving American artist living in Paris. Far too healthy and glowing from all that tap dancing. The one and only saving grace was the fantastic Gershwin score. Whoever did the decor here seems to have a glass vase fetish. Very distracting - in spite of the entertaining standoff on climate change between Annabel Crabb and Andrew Bolt. A frenetically good episode. Nice to have the backstory to the mysterious Ood filled in and the Doctor was his usually intuitively hyperactive self - all popping eyes and flying trenchcoat. Love it - although I think I prefer the episodes where they go back in time to a historical period. We'll see - maybe a future episode will change my mind. So boring...I went to bed after 45 minutes. Can Michael Kitchen (?) be any less charismatic? The French countryside is beautiful. Less beautiful is the shouty commentary of Phil Liggett. Really I'm just impressed anyone can ride a bike up those mountains and not want to get off at some point and walk. Well I survived my big week of four late nights out in a row and am very pleased to see Friday evening arrive with nothing more ahead of my than flopping in front of the TV. ( To understand the significance of this you need to understand that for the last few months more often than not I have been in bed by 9!). Legendary Anne remembered to record Gil Mayo for me and gave me the heads up that this episode contains another fantastic grammar commentary...can't wait! Other than that the weekend holds a variety of commitments and outings. Hopefully, Saturday will start with breakfast, closely followed by a facial at ella bache. Then midday sees a quick rehearsal for Sunday afternoon's concert. I've never played a piano trio of this kind before. At our one and only practice yesterday we discovered it's pretty squashy...frequently hands running into each other. It's also much more challenging in terms of ensemble! All this combined with the usual weekend household chores and my wonderful father continuing his painting of the inside of the house should make for some fun times. I have spent the last two days trying to get enthused about some thesis to book editing. I have to admit there's a terrible lot of procastinating going on! And somewhat frustratingly while working my way through the third chapter I found around 5 errors (words missing or in the wrong order in sentences) that had slipped through my hundreds of readings prior to submission, two supervisors, a proof reader and three rigorous examiners!! At our "think pink" cancer fundraising morning tea I won a little prize for "most creative pink scarf"
Wendy's stylish pink and silver thread scarf was supplied courtesy of target's winter sale. Mamma Mia (the film) was the topic of discussion at bookclub last night. I took my Abba Gold compilation for everyone to enjoy and Anne M provided the cd player. So we had our own little soundtrack which Jinx and I joined in with every so often (hopefully this wasn't too annoying?!). We all agreed that Streep was the real star here. She really looked like she was having a whale of a time singing and dancing, but for me the real highlight was the drama and emotion she managed to convey through the scene on the hilltop of The Winner Takes it All. Personally, I was astonished at the depth she conveyed here - and this song went from being one of my least favourite ABBAs, to one I am now desperate to find the sheet music of - and play myself. The consensus seemed to be that the women were much stronger than the men - basically because the script gave them more to work with. Julie Walters hammed it up beautifully, and Christine Baranski brought a tattered elegance to her character. And as for poor maligned Pierce and his questionable singing ability, Jinx, Jan and I couldn't understand why the various audiences we saw the film with, found this so hilarious (Anne M!!). Sure, he's no Placido Domingo...but for me, this is actually what is so attractive about Mamma Mia....it's so firmly located in the everyday. No one appears so fantastic in their singing and dancing ability...it wears its ABBA fandom front and centre. So as the audience we can identify clearly with the poor singing of Pierce (and, I must say, the awkward dancing of Colin Firth) because that's how we might look up there. And I think the thing about ABBA, and much pop music is that it's simplicity on first listening is deceptive. Many of the songs ask for quite a big vocal range and singing ability, without which they just don't work - which makes the achievement of any of these actors (none of whom are known for their singing) more commendable. The other talking point that the film inspired was the place of happiness and fun in our lives. Where does it go as we get older? How can we recapture the sense of joy that pervaded the film? Because, as most of us realised while we were watching, the responsibilities and routines of our lives frequently obscure our enjoyment of the little and big things. And as Ann H wisely pointed out, it's our consumer culture's driving quest for happiness that actually prevents us from ever reaching a point where we are content. So the more we explicitly search for things or events to make us happy, the less likely we are to recognise or find joy in life. Nothing is ever enough. A big night at rehearsal yesterday evening. I was a little bit wrecked today - luckily it was a quietish day at work and I didn't have to turn my brain to any teaching! It was 10:20 before we got out of there...I don't mind a big rehearsal - but let's finish on time!! At least the temperature was less like a freezer. I really think I'm going to have a do a little practice of some of the songs. Usually, just the repetition of rehearsal enables me to learn them without having to do anything at home. This time though, there's some I'm just not getting. They need some careful practice - like Kansas City - lots of cute, deft writing here - but I'm pretty sure it's for other instruments not piano as it just doesn't fit under the hand very nicely in the orchestral reduction. And I just know that I'm going to be REALLY sick of "Cain't say no" by September. what secret madness lies within? Anne and I managed to meet for Foucault this morning. As always it was a productive and wide-ranging discussion. We changed location from the library (somewhat clinical and grey, although nonetheless pleasant) to our favourite coffee place (dynamic, vibrant and noisy). Arriving at work I wondered if this had altered the tenor of our conversation. Usually we meticulously work our way through the chapter - often page by page and line by line - dissecting, analysing, criticising. This morning we just jumped straight into to a broader discussion of what the reading told us about Foucault's historical practice. As Anne neatly noted, Foucault's practice of history is connective, rather than the traditional practice of narrative history. This is the history of the resonances of the past in the present. So while he is writing about the development of modernity using archival sources and accounts of the development of social institutions, the connections with contemporary culture frequently freak both of us out! Particularly me, as although I have read this before - and indeed quoted it liberally throughout my phd - I am starting to wonder if I read it with my eyes shut! However, maybe this is just the mark of a dense and rewarding book - one that offers new ideas and inspirations on each return reading. Or maybe I am dense....? For Foucault, it seems that this political function is executed by the operations of the examination, classification and distribution etc - by which individual differences are illuminated and recorded in the movements of normalisation. It is these differences that mark one as "individual" - "when one wishes to individualise the healthy, normal and law-abiding adult, it is always by asking him how much of the child he has in him, what secret madness lies within him, what fundamental crime he has dreamt of committing." (193) Our secret madnesses - what might be considered abnormal - are at the very centre of the normalising examination, they are fundamental to its success. And it seems it is this that produces the reality of the individual within the disciplinary regimes. Foucault's comments on the democratisation of turning real lives into writing is interesting to consider in light of the technologically-enabled collapse of the public/private opposition. Indeed it would seem that the endpoint of discipline is now fully in view, particularly with the intense proliferation of the practice of exhibiting/writing real life in public platforms (such as for instance, this blog). And what does it mean that as individuals we now take responsible for illuminating our own "secret madnesses", through the throes of public self-examination. I guess it means they aren't so secret any more for one. This, I suppose, is an example of what Deleuze calls the society of control, where the disciplinary operations have become so profuse throughout the social field, that the institutionally specific operations Foucault uses as his examples, have been superceded, so that the social field is "all-at-once", open and modulating. i see Angelina Jolie called one of her twins Knox. IS HE A FORT? I was intrigued to note the Pope's red shoes when he landed in Australia. Apart from being a fantastic colour for anyone's shoes, I wondered why I had never noticed such fine footwear on the previous Pope. Were my skills in observation on the wane? It was Anne and her husband Matthew (via Google) to the rescue. It seems it was a tradition in the middle ages for nobleman to wear red shoes. This was continued with the office of the Pope, and red shoes originally also had a special buckle and a cross as well. Well it seems that the tradition was discarded by the previous Pope (who favoured plain old brown shoes), but reinstated by the current Pontiff. They're made of finest Moroccan leather apparently, but without the buckle and cross. I wonder if he has just one pair or a multitude for various occasions. Are they just for "good" or everyday use as well? Will replicas be on sale in the World Youth Day Shop along with all the other religious paraphernalia? Should there even be a World youth day shop? I'm not sure what I think about all this...although being particularly unreligious I don't think I'll lie awake nights worrying about the commercialisation of religion in contemporary culture. Whatever - they're very noice shoes. This made me laugh out loud today so I'm sharing. Going back through old cds seeing what I wanted to transfer into itunes I found this hidden away on a They Might Be Giants cd (The Spine). I had forgotten how simple yet funny I had initially thought it was. Of course it's the melody and arrangement as well that is comic (the punctuating brass and call and response style) - but the words are fairly wonderful as well. Less laughter when I discovered I can't find my copy of Mink Car...WHERE IS IT? 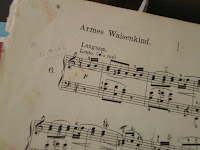 I spent a pleasant half hour this morning going through some old piano music that had been given to me. 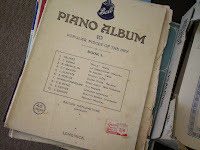 Originally belonging to local piano teaching legend "Aunty" Jean Limpus (now sadly no longer with us), there are some wonderfully historical pieces in here, as well as some bits and pieces that I will be able to use with students. Things like the Bartok Mikrokosmos that I have never got around to buying, as well as lots of easy piano duets. I was impressed with the date in this well thumbed and yellowing Schumann Album for the Young. Standard piano teaching practice is to write the date at the start of a piece when a student starts learning. This one - 1926! 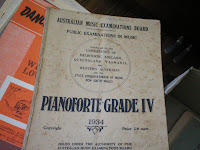 And this one shows us how the AMEB has been publishing their grade books for quite some time. I wonder if in 1934 they also seemed ridiculously over-priced. 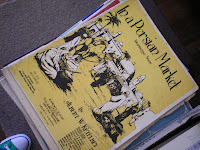 And lastly, what wonderfully dramatic covers sheet music used to have. This just one of many in this vein. About a month ago the Bundaberg Chapter of the Foucault Reading Group (BCFRG) met and decided to reconvene a few days later. This second meeting didn't actually happen but is now scheduled for next Wednesday morning. So all those who have been on the edge of their seats avidly waiting for my follow up post on "The means of correct training"...(and no doubt there's many of you!) never fear...a post will be forthcoming in a few days. Now just to find my copy of Discipline and Punish... I had it somewhere round here...I have a little reading to do. I finished Wild Swans during the week. I am now less ignorant than I previously was about the journey of 20th Century China...but I'm sure there are a lot of gaps that still need filling (the same goes for my understanding of middle east politics but that's a whole other story). The story of China is told here through three generations of women from the one family - moving through the feudalism of late 19th and early 20th centuries, through the rise of communism and the Mao era, through to the present day and the opening up of China to the West. I found the whole thing fascinating. Jung Chang struck a wonderful balance between historical detail and information, with her personal family story. What shone through was her own optimism in the face of an often harsh and violent life. It seems communism is all very well in theory, but doesn't seem to work very well in practice. I hesitate to offer simplistic explanations of why this may be...but it could because human nature is irrevocably flawed...and to coin a cliche...power corrupts. I am keen to read her biography of Mao sometime in the future. The Hollowmen exceeded my expectations...which had been a modern day version of Yes Minister/ Yes Prime Minister. Of course there are definite echoes of these fine British comedies, but The Hollowmen is much more than satire on the machiavellian maneouvres of an apparently unbiased civil service. What I found in the first episode was a cutting and incisive dark comedy on the absolute failure of modern democratic governments. Policy-making and implementation becomes defined by increasingly futile gestures (awareness campaigns, meetings with "key stakeholders") in the continuing and desperate search for a positive media response. Decisions are driven by ineffective polling and the ebbs and flows of the neverending news cycle. All is reaction...never action. The metaphorical absence of genuine leadership in contemporary politics is signalled by the literal absence of the Prime Minister in The Hollowmen. We never see him. (This was the original concept for The West Wing also but it didn't eventuate there). Whether this conceit can be effectively maintained remains to be seen...but I enjoyed it in the first episode. So is there a resonance with the Eliot poem....sure. The poor souls in The Hollowmen's Central Policy Unit do indeed engage in plenty of "gesture without motion". They are seemingly at the mercy of the machines of publicity and spin, which they rely on to produce the appearance of government, but are also beyond their control. I'm not sure what the benchmark of song repetitions is that one has to reach before a song is stuck in your head for almost 24 hours, but clearly I passed it at practice last night. All night (even I believe while I was asleep) I enjoyed "OOOHHHH - K! - la-ho-ma, where the wind comes sweeping down the plain" - just this phrase mind - not the whole song or anything. The same little melody over and over. My futile attempt to go to sleep was continually thwarted until sometime after midnight. I refused to get up and look at the clock as I just didn't need to know. And what's even more fantastic...I'm still reliving it this afternoon...although now it's part of a weird remix version that includes bits and pieces of "Friday on my Mind" (guitar riff from the opening) and "Ain't Too Proud to Beg" (the bass line) - both from the car stereo. I have spent the day trawling through third chapter of my thesis. This is where I think it actually starts to get interesting - with the analysis of very early, experimental TV images (although it is conceivable that I am biased and the rest of the population would find it as dull as the proverbial ditchwater). I did have the great thought that maybe this should be the basis of the paper for the Velvet Light Trap - on mechanically scanned television being a technological failure yet having much to tell us about the contemporary practices of television production and the whole notion of liveness. After about 24 hours musing on this I realised that this was the paper I have already had published last year through Westminster Papers etc. Darn it! So now I have to continue with something new - which is a good thing in terms of future research, but much more effort than picking the eyes out of my thesis for a paper (yet again!). I guess there are only so many papers to be extracted from a thesis - and perhaps I am reaching my limit. I'm looking forward to watching and giving my verdict very soon - although it's always a bit tricky to judge a new series on the first episode - so we'll see. sometimes working dog really hit the mark (Frontline) and sometimes they don't (Funky squad). Against my better judgment I quite liked thank god you're here - although it's quality was always so dependent on who the guest actors were. Some people clearly cope better with improvisation than others. "Our dried voices when we whisper together are quiet and meaningless" - beautiful...I wonder if and how the TV series resonates with Eliot's poem (the rest of which you can find yourself through the vast resources of the internet). For all those concerned about the risk of hypothermia at the theatre, concern yourselves no longer. Wool socks now acquired just in time for rehearsal tonight. Big W to the rescue! Today I return to the book writing as Wednesday and Thursday are non-teaching days this term. It's the best chance I have during the week of getting something substantial achieved. I haven't even looked at it for three weeks. Very bad. And, as always, it takes at least a day to get my head around where I was up to when I last left it. It's not that I meant to take a three week break...it's just that others things have taken priority in the meantime. So now I delve back into the dreaded theory chapter trying to work out just how I can make this more palatable for readers...assuming of course that one day there will be some. Dr Who was much closer to its best on Sunday night. New Dr's companion Donna Noble was introduced - with Catherine Tate bringing some much needed personality to this role. Previous season's Martha Jones was okay but the character took herself a bit too seriously I thought. The evil supernanny was an excellent concept - and the weaving in of an obesity storyline was nicely crazy and topical at the same time. Best of all was the teaser with Rose Tyler returning very briefly in the final scenes...I can't wait to see how this unfolds over the season. First day of Term 2 today. As well as lecturing this morning, this afternoon I had time to start thinking about a paper in response to a call from Velvet Light Trap - on failures and flops. I'm keen to write something about Arrested Development. Personally I thought it was a great show that, in Australia at least, never got the timeslot it deserved. However, it's interesting for other reasons as well. Although it was a critical success winning many awards, it never gained more than a niche audience and the network gradually decreased the number of episodes as the three seasons progressed. Until finally it was cancelled. For a program that was fast, witty and fitted into the fashion for mockumentary style sitcoms, it's difficult at first glance to understand why it didn't gain more of an audience. Do sitcom audiences really want the same old formula? Maybe - Everybody Loves Raymond I'm looking at you. But then Seinfeld wasn't the same old formula and it proved to be a blockbuster. Maybe Arrested Development came too soon after Seinfeld's demise - landing right in the middle of the fashion for murder, detective, forensics in which television seemed to be awash a few years ago. Sitcoms in any form aren't really the current flavour of the television month. Are mockumentaries destined never to attract anything more than a niche audience? In Australia, Summer Heights High seemed to prove that wrong - consistently winning it's timeslot. But then we are a much smaller television market than the US. Are niche audiences all that's left in our multi-channel television landscape? Working Dog's new series The Hollowmen looks like it's trying to do for federal politics what SHH did for education. We'll see if it has a similar appeal - perhaps it will prove more cerebral than Chris Lilley's comedy of sometimes cruelty. Politics might also be less palatable to the school age audiences of Summer Heights. Time will tell. With it's fast moving script perhaps audiences found AR too "cerebral", but then it also had a delightful sense of the visually ridiculous (the stair car, the banana stand, the segway and so on and so forth). I'm undecided on all these questions, but I did start looking for reviews and critiques of Arrested Development this afternoon - finding some interesting news articles as starters. Rehearsal yesterday afternoon was a good time for me to become more familiar with some of the lesser known songs as we worked our way through most of the solo numbers. One in particular stood out - "Lonely Room". Very atmospheric writing here from r and h. It's such a concise and effective way of establishing character and motivation for the menacing jud. While there is no "tune" in the traditional attractive broadway sense of the word - this was the one song I went home humming for the rest of the evening. Almost a little like Sondheim - whose work thrives on unexpected tonalities and modulations. The funniest thing on television this evening was Better Homes and Gardens where the handyman made what looked like a really ugly spiral sculpture out of old bits of wood - some of which were painted black (as you do). If you didn't see it you don't know what you missed. As he was putting it together, it was like an episode of Mr Squiggle where a few dots and lines on a page would be gradually joined together and then...ta da!...suddenly it's a picture of an elephant (or a rocket ship). Except Mr Squiggle's pictures always eventually made sense (once Miss Jane turned them up the right way)...whereas this little wood item left me asking of no-one in particular..."WHAT THE HELL IS THAT??" And then when it was finally revealed I laughed. Apparently, Mr Handyman informed me very helpfully, that it could be used as either a kitchen stool... or a coffee table. I'm currently enjoying Thursday evening's Gil Mayo mysteries on ABC1. A group of four quirky detectives who solve a mystery each week, the best thing is the lead character's inclination to correct the grammar of his colleagues. Last night we were taught that it should be "different from" not "different to". What I also like is that it's a detective program that is not fixated on showing autopsies in their full gory detail all over the screen. It's more in the vein of the English detective program of manners - a la Agatha Christie. For 6.99 this morning I bought a copy of Steve Martin's The Man with Two Brains. What a strange little comedy this is. I'm a big fan of Steve Martin especially his films before he started making inoffensive family goo. Roxanne is a classic, All of Me fantastic and LA Story is a delightful romantic comedy as well. The Man with Two Brains owes a little to Frankenstein and a lot to the question of the mind-body split. When you know that Martin studied philosophy you can perhaps see the appeal of this screenplay to him. However, it hasn't aged that well. It took well over half the film before we even got to the question of the two brains, and then suddenly in the last 20 minutes the narrative took off. The setting up of the relationship between Martin and Kathleen Turner's evil femme fatale was laboured and not very interesting. The problem was that the comedy was incidental to the story - the jokes were add-ins, rather than narrative or character generated. It was all a bit skit-like (perhaps still owing too much to Saturday Night Live). However, it still far preferable to anything from Adam Sandler, Rob Schneider or the current crop of what stands in for so much film comedy today. I also picked up Les miserables (with Liam Neeson - no singing) and a discounted three pack from the Coen brothers - The Big Lebowski, Intolerable Cruelty (there's always one dud in these packs) and O Brother Where Art Thou (what a fabulous soundtrack!). Plus three Jodi Picoult's that were loaned to me - thinking I should see what the bestselling fuss is all about - although I don't hold high hopes for these. The problem is that I am both a shopper and a hoarder. So any bookshop I go into I feel compelled to buy something - no matter how many are waiting at home to be finished, or even started. Next on the list of want-to-buys is Murray Bail's The Pages, despite the slightly lukewarm review in today's Australian. His Eucalyptus is one of my all time favourite Australian novels.